I'm using 1.80b5 and this was NOT present in 1.76-1.80b3. Untitled.png​ (130.3 KB) - added by cybrian 9 years ago. How does it work on b5? If you go back to a previous release, is it fixed? I ask because I am not seeing this issue, so it might be a local problem. Alternatively, does emptying the browser cache solve anything. Yep. On 1.76 and on 1.80b4 or older it works just fine. Is there any way I can turn on some debug mode or something so I can give you guys more details? Deleting my plist files and starting from scratch is NOT an option because I have 626 torrents seeding. Did you try deleting the cache with b5 or later? If so, what specific steps should we take to recreate this bug? I have the exact same result. I run transmission on an Popcorn Hour. 1.76 runs fine. Starting from 1.80b3 the gui behaves really strange. I have almost no processor usage but the longer transmission runs the more unresponsive it gets. Especially with lots of downloads. From the command line I get similar results. Also the download speed decreased a lot so this might have nothing to do with the gui but with something complete different. cybrian, what message do you get when you click the details button. For completeness: I tested this in Fluid (which uses Webkit), Firefox 3.5.x and Opera 10.10. So it's not a browser issue. I am unable to reproduce this on 1.80b5 so and much detail and help as possible is very much appreciated. Since I tried three totally different browsers, there is nothing in the browser cache that could cause this. 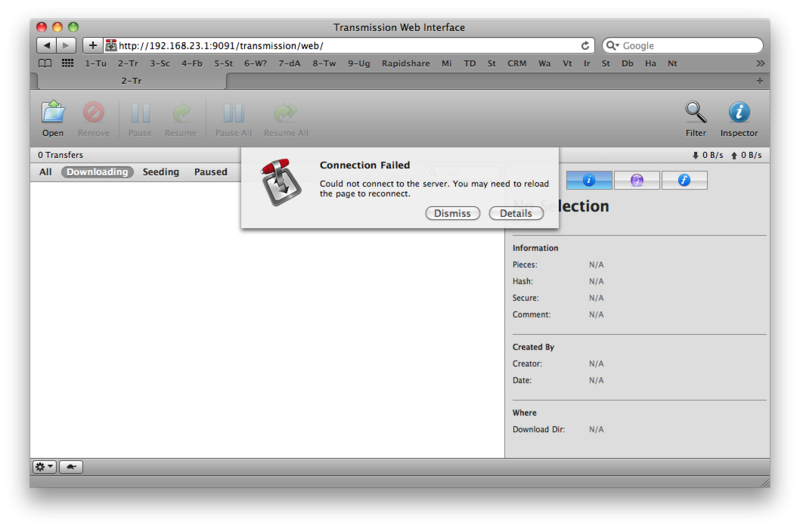 And my Opera install had never accessed the web interface before, so it didn't have anything from it in its cache.